Posted on May 22, 2012	by Lou Murray, Ph.D. I enjoy photographing things when they are still growing more than harvested produce, so as usual my photos are heavy on plants in the ground vs harvested ones in the trug. But I’ll lead off with some harvest shots. My last red cabbage split, but it tasted wonderful fried up with an onion and some German sausages. 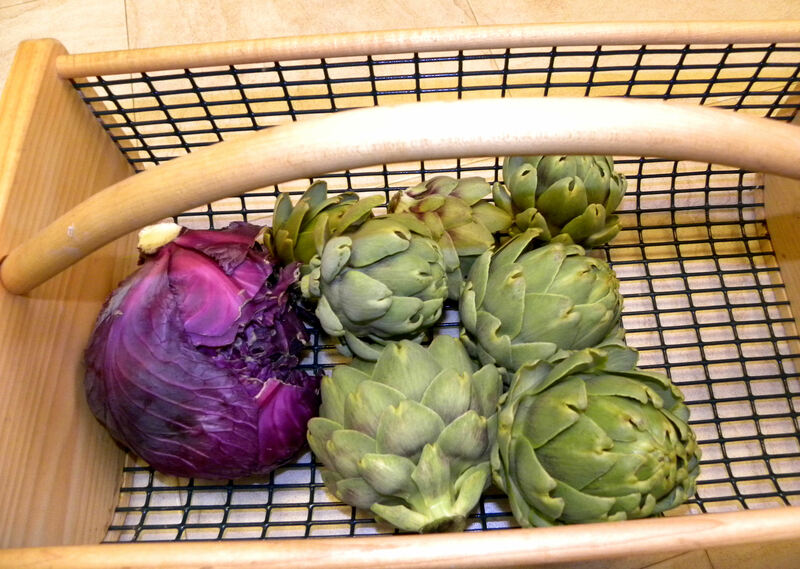 Seems that the artichokes all got ripe at once, but they tasted great cut fresh from the plant and plopped into boiling water. Dipped the leaves and heart into lemon butter. Oh, my. Heavenly. This is what a perfectly ripe avocado should look like. 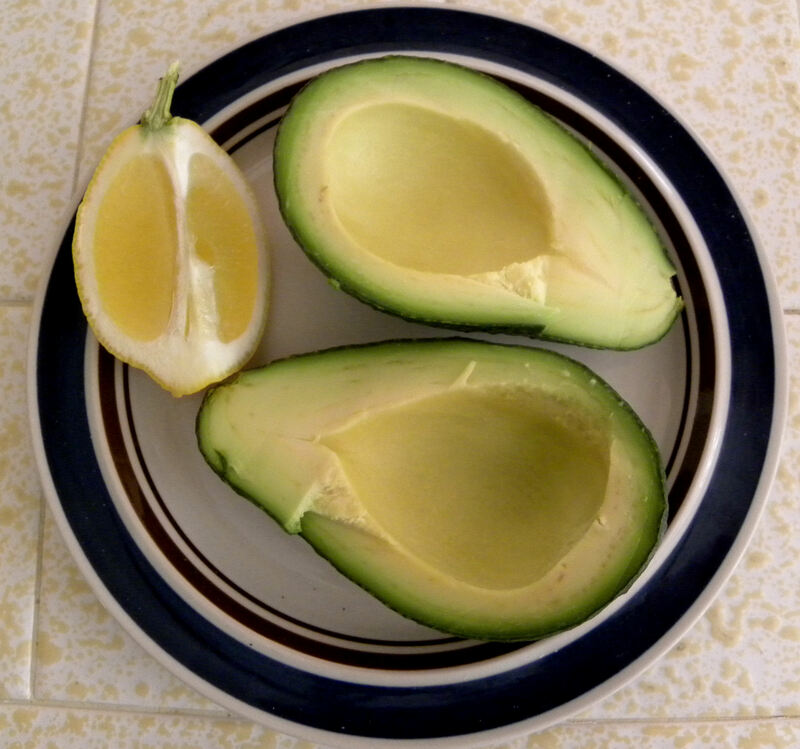 I like to squeeze lemon juice into the avocado, sprinkle on some sea salt, and eat it with a spoon. 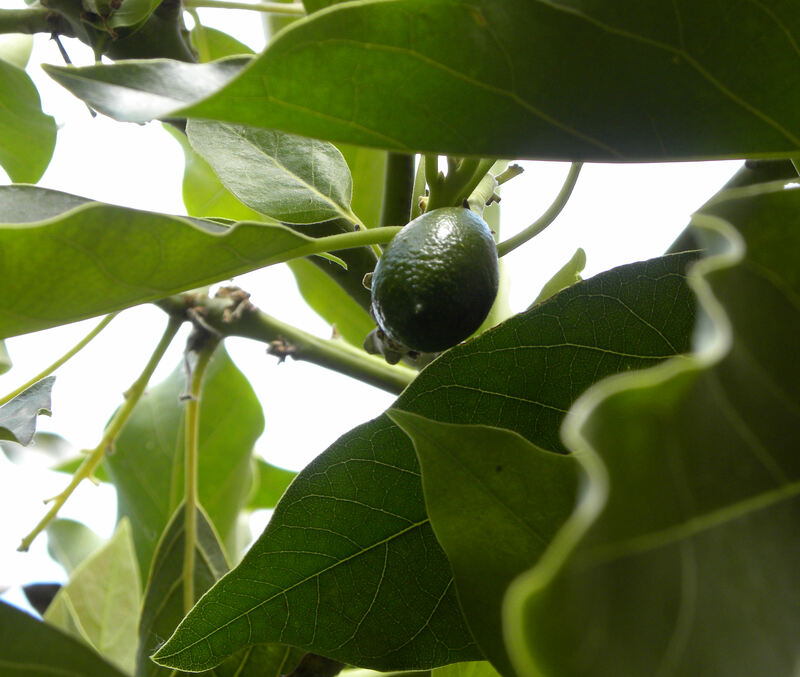 I’m down to the last 9 avocados on the tree, with only one new fruit set that I can find. It looks like I won’t have the wonderful abundance of avocados next year that I’ve enjoyed this year. Our avocado has finished blooming. This tiny avocado is the only one that I can find. It won’t be ready to harvest until next January. I’m hoping that there are more avocados hidden among the leaves. 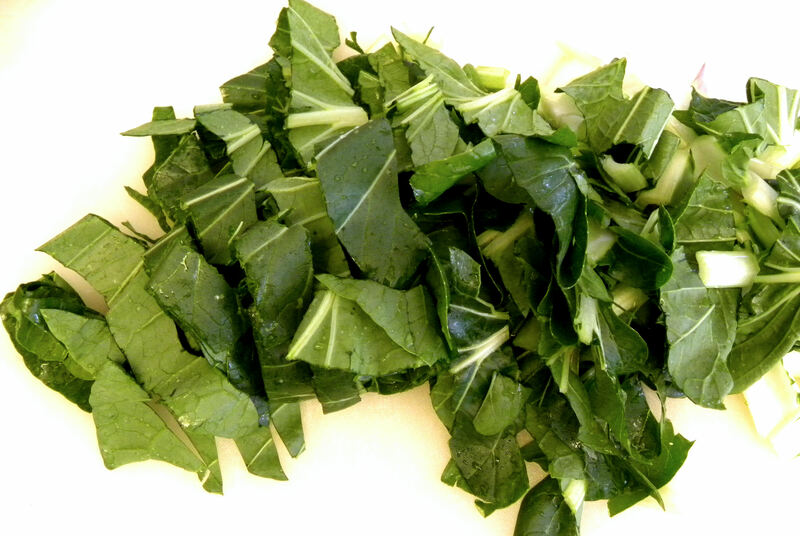 Oops, I nearly forgot to photograph my first harvest of bok choy from my new raised bed. 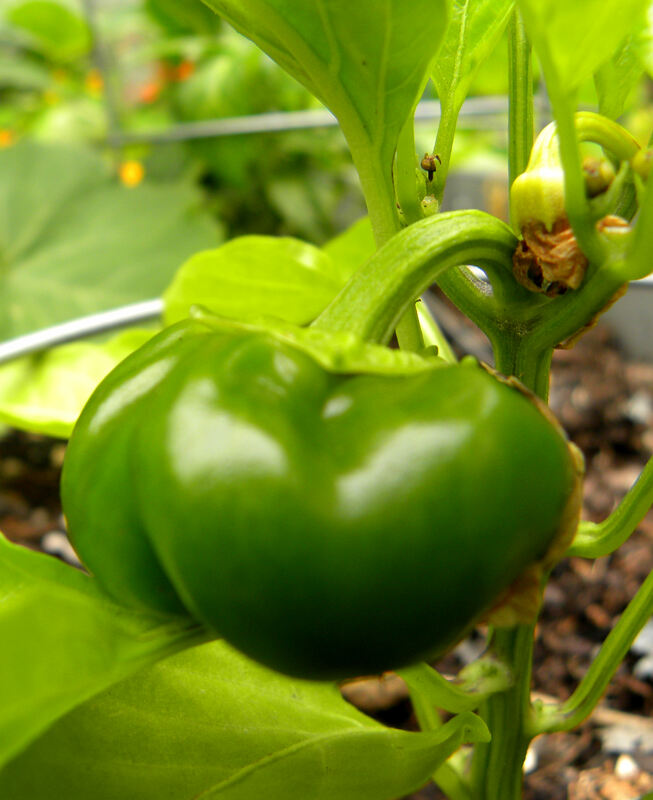 I pull the outer leaves rather than the entire plant so that I can extend the harvest from my six plants. I see that I neglected to photograph the peach harvest. I got over four pounds, but they are small, so nearly half of that is pit and skin. I spent a long time preparing the fruit for a peach dumpling recipe from a Smoky Mountain cookbook. Sadly, the recipe turned out awful! There was obviously a mistake in the cookbook because it said the dough would be stiff. But it made a runny batter, not a thick dough. I added more flour, but the dumplings cooked up like paste. Or maybe glue. The fruit sauce was tasty, but I ended up feeding the dumplings to the hens. They loved them. What do they know? Our Santa Rosa plums are nearing harvest size. They will turn deep purple before they’re ready to pick. 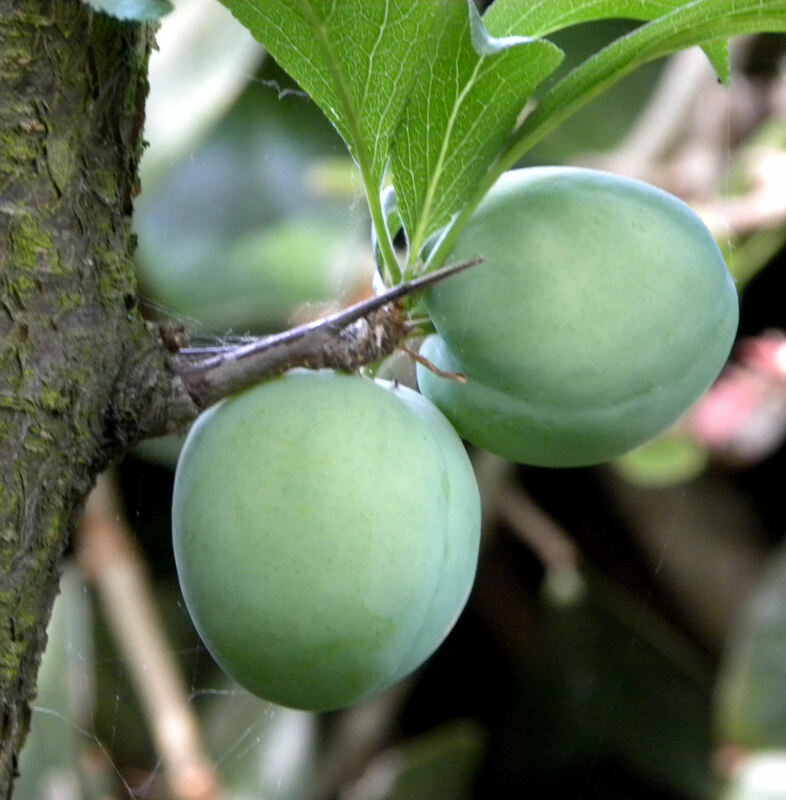 We have a large tree, but only four plums on it. Our Katy apricots are also nearing harvest. We have four of them. Not a great year for either plums or apricots in our yard. 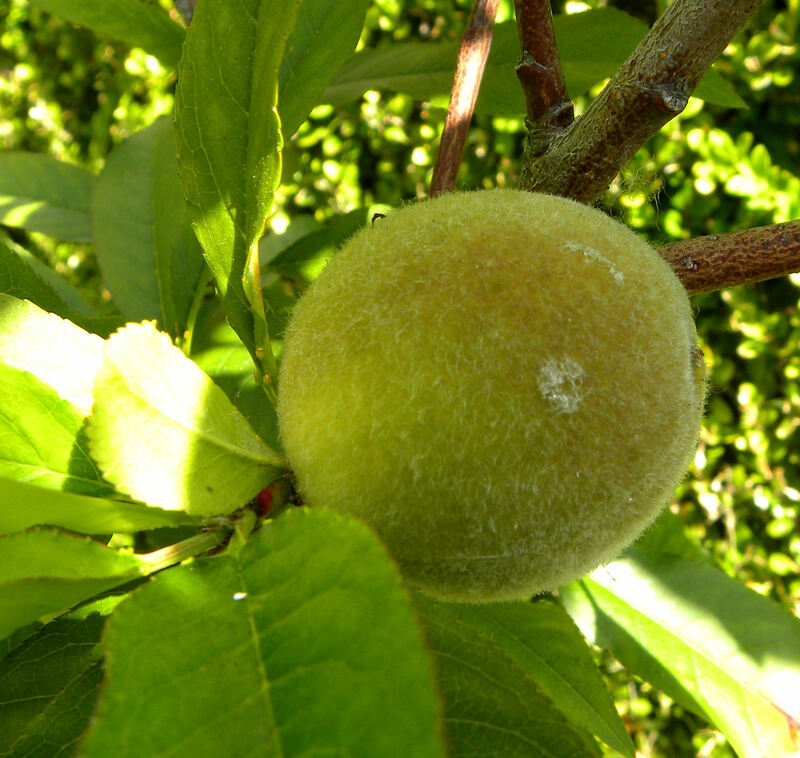 Our very small August Pride peach tree set only three peaches this year, but it looks like they will be large ones. I didn’t photograph the Babcock Improved peaches, but that tree set quite a few peaches. They will be the last ones to be harvested. The Snow Queen nectarine is still blooming, but so far about a dozen nectarines have set. The Panamint nectarines are nearing harvest, maybe 30 of them. The fruit set on our Granny Smith dwarf apple has been pathetic so far. There are still a few more blooms, so maybe we’ll get more. The honey bees have been noticeably absent from our yard this spring. I was happy to see several of them today, so there is still time to get some apples fertilized. 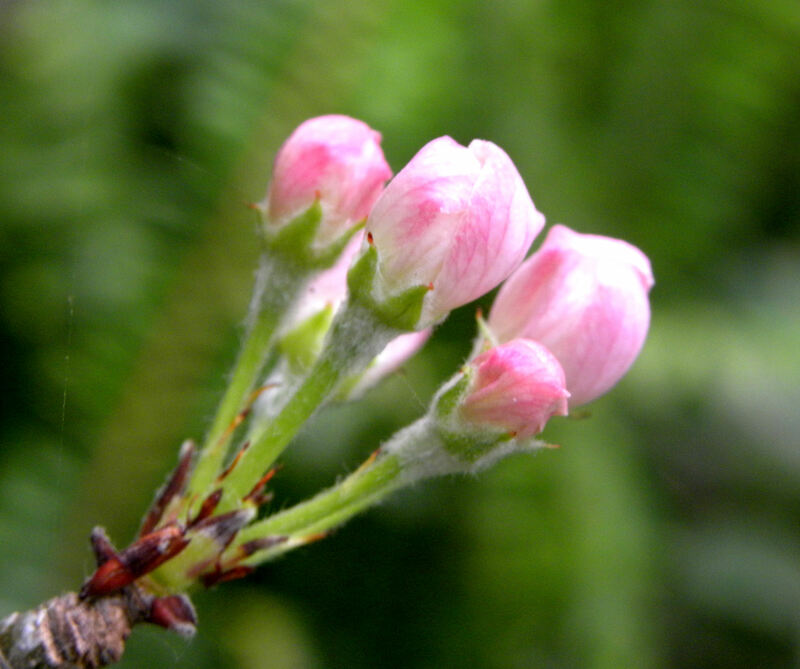 The Granny Smith apple tree is almost done blooming, but the Gala and Fuji trees are just beginning. It was a warm winter here, so there may not have been enough hours of chill for the Gala to set fruit. It requires a few more hours chilling than the Fuji or Granny Smith. 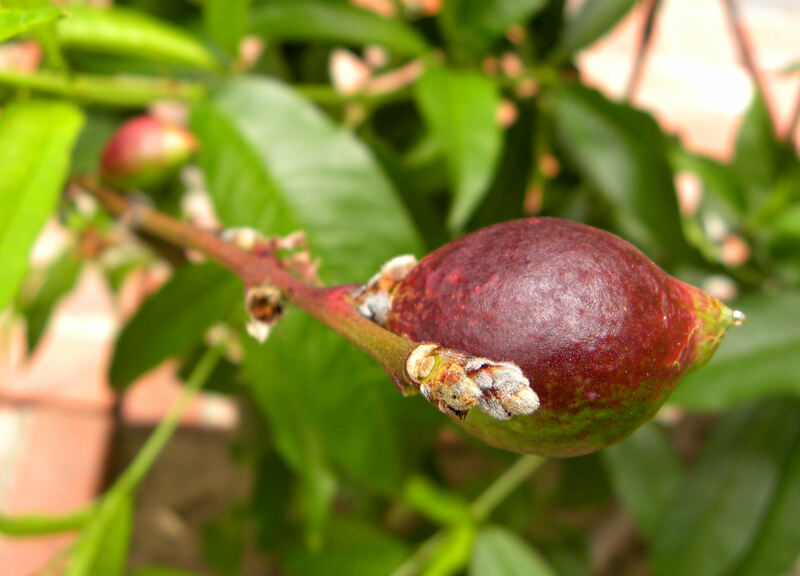 Sadly, neither of my Asian pear trees got enough chilling to set fruit this year. Darn global warming. 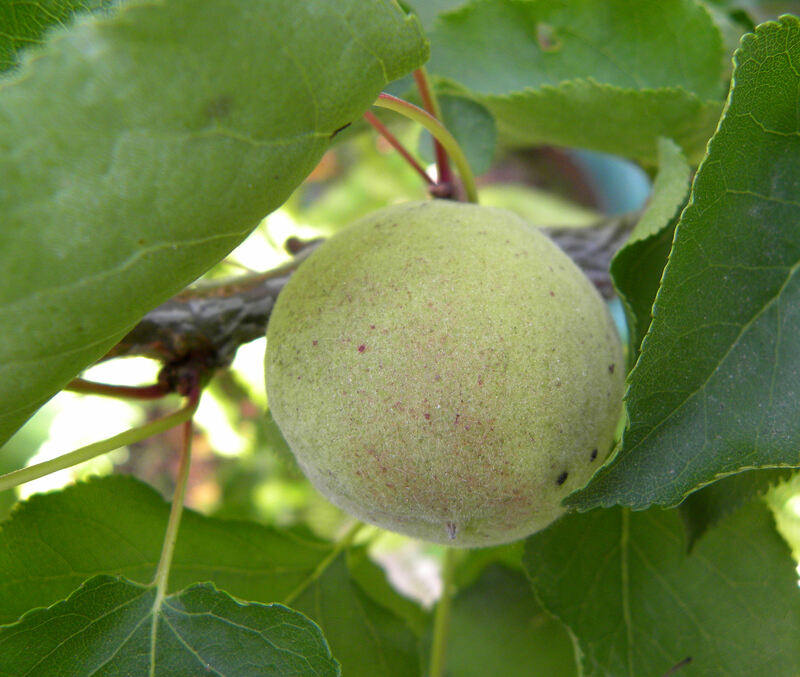 The Fuyu persimmon tree appears to have set four fruit. The brown part is the dried petals of the inconspicuous flower. The swollen green part under it is the ovary, soon to become a persimmon I hope. 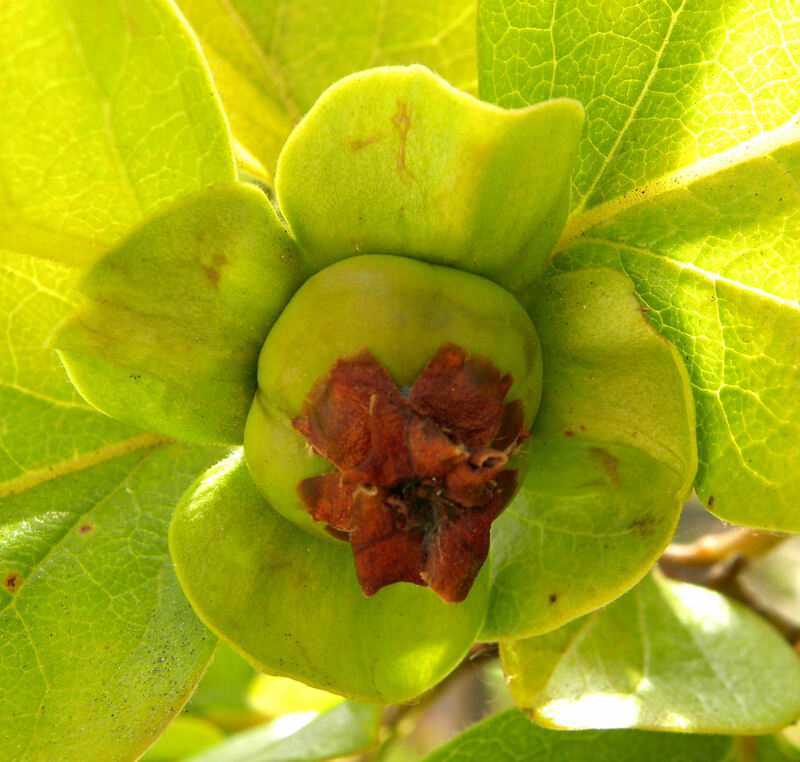 The green “petals” behind the tiny fruit are actually the sepals. Last year I had one fruit, and it fell off at about this stage, so I’m not counting on a harvest quite yet. 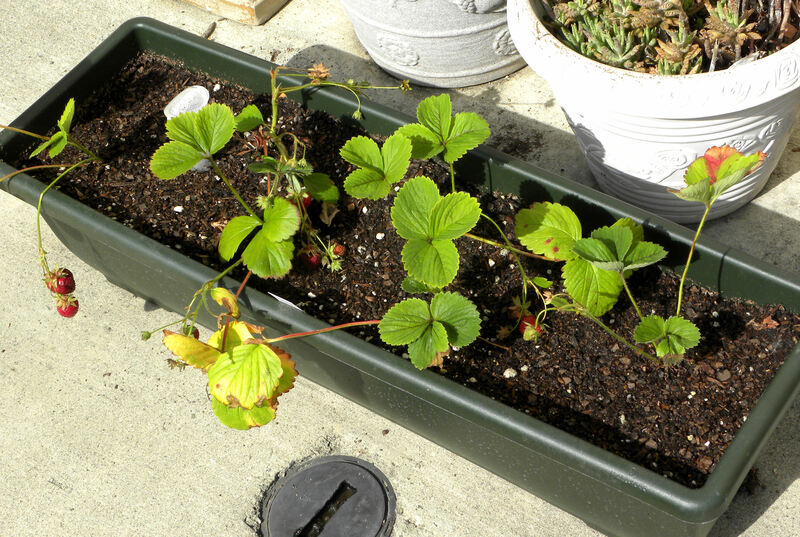 I just finished planting two self-watering planters with Sequoia strawberries. They are June-bearing rather than ever-bearing. I may have planted them too late to get much of a harvest this year. We’ll see. 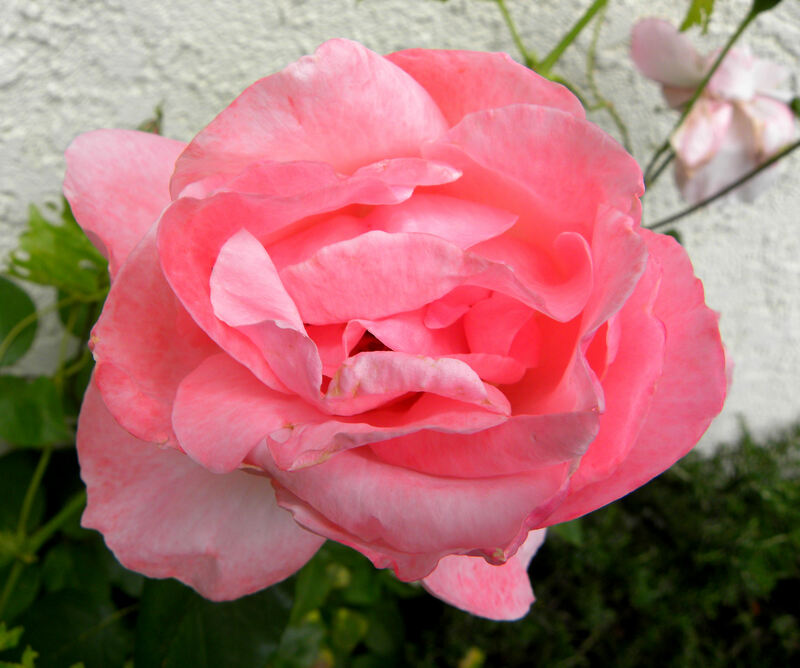 I’m out of space in the yard, so this is one more thing that I’m growing in my driveway. 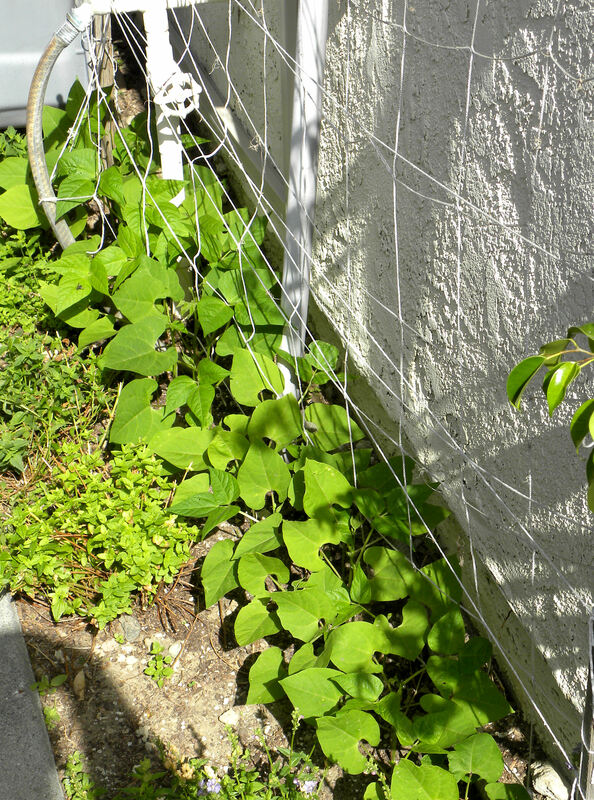 The first tendrils on my Cherokee Trail of Tears beans have reached the netting and are starting to curl up the string. Once they do that, the vines really take off and grow. This is another of my space-saving techniques, using this useless little strip of dirt by the gas meter to grow crops. The raised beds in back look like a jungle, not that I’m complaining. It’s mostly tomatoes and peppers, with some kale, leeks, Brussels sprouts that aren’t making any sprouts, etc. 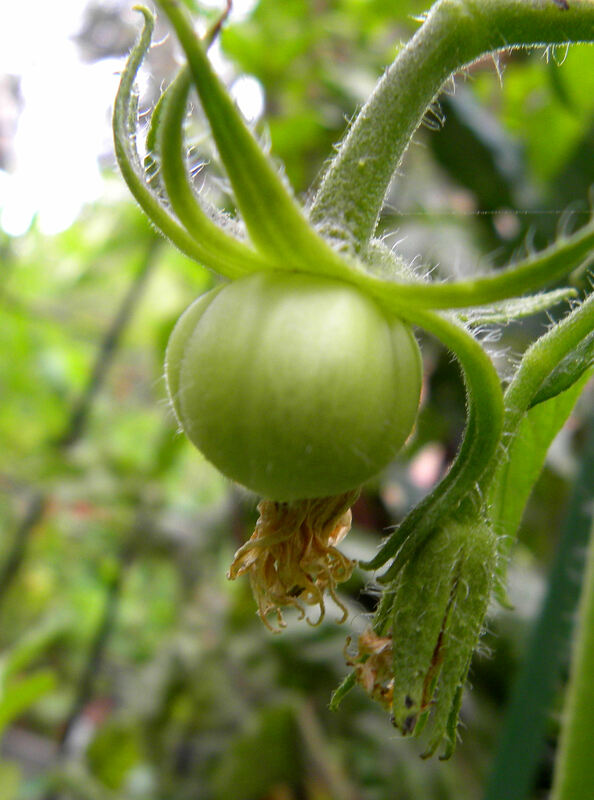 My tomatoes are beginning to set fruit. This is a Mortgage Lifter. This is a new variety for me, Box Car Willie, named after a country singer of the 1930s. Such a cool name. I hope they taste good. 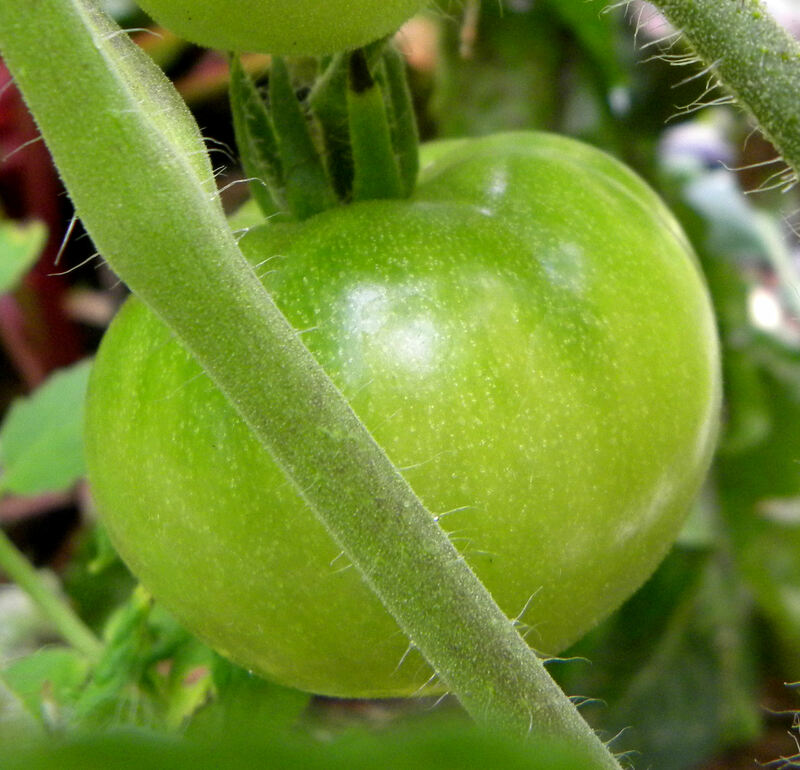 The only other tomato to set fruit so far is a Black Plum, another new variety for me. 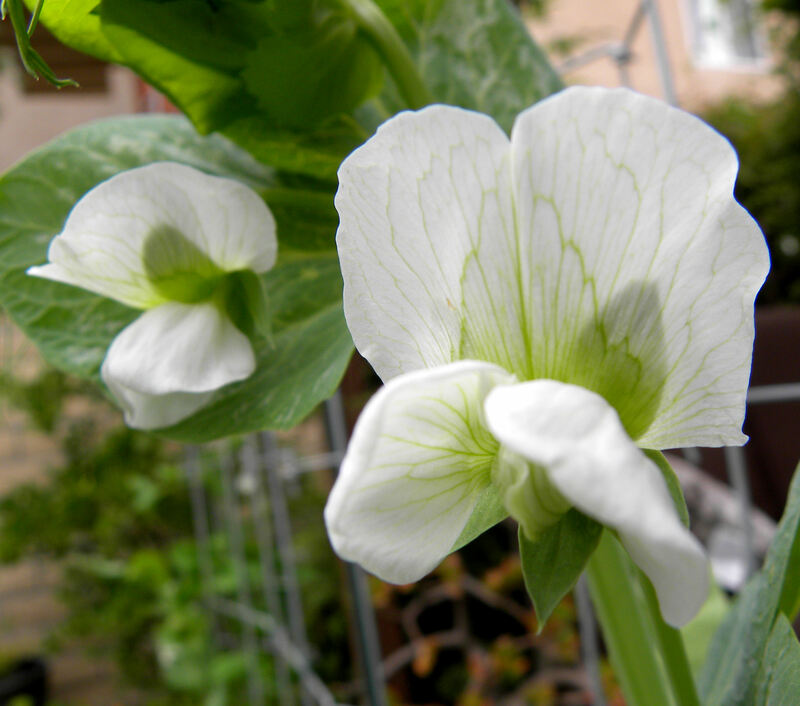 My second crop of Mammoth Snow Peas for the year has begun to flower. My Super Sugar Snaps aren’t far enough along yet to flower. It is going to be touch and go if I get any Grandpa Admire lettuce. 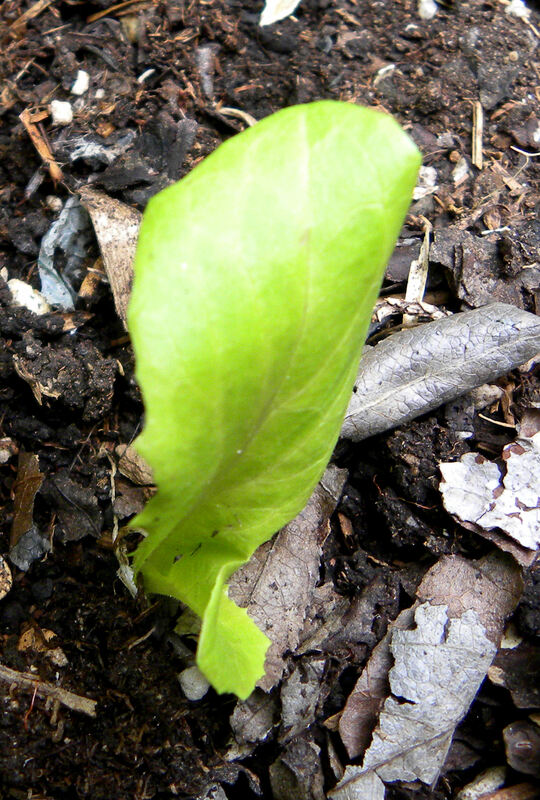 Out of 23 sprouts, this is the only one to survive. Either insects or drought got all but three. Then a neighborhood cat used my raised bed as a litter box and killed the other two. Such is gardening. This misshapen, misbegotten thing is supposed to be a Golden Bell pepper. It has a long way to go before it is ready to harvest. 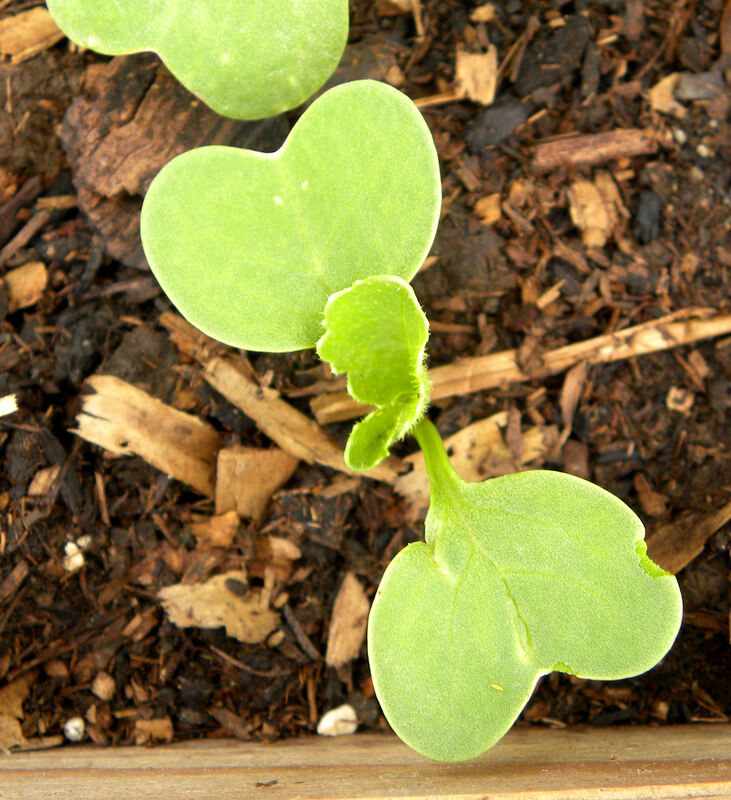 This is one of the mystery pumpkins or winter squash that sprouted from my compost pile. I transplanted it and will let it grow for a while. I should at least get some squash blossoms from it. 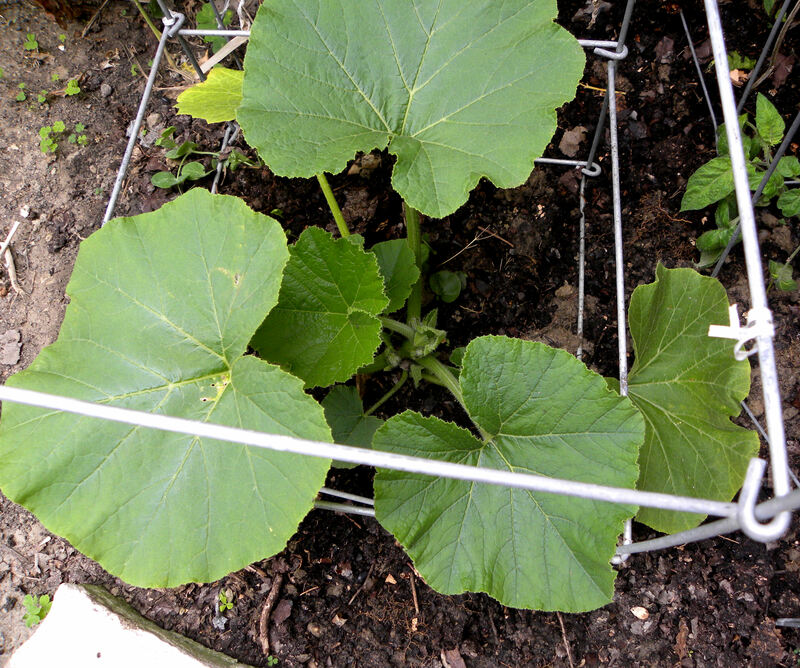 To save space, I like to let my winter squash climb up a tomato cage. Works for butternut squash. Probably won’t work for a heavier pumpkin. 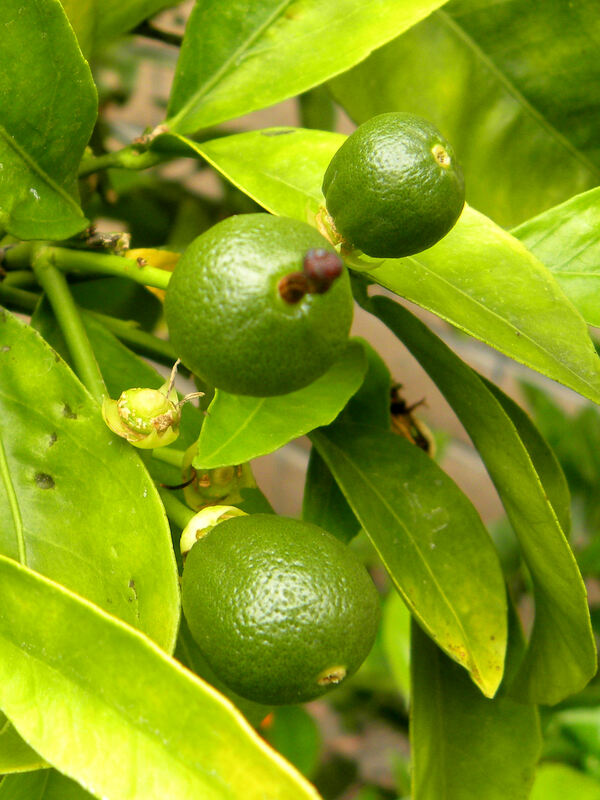 Our semi-dwarf navel orange tree has set fruit. It looks like we’ll have a good crop next winter. I still have a few more oranges left to harvest from this year’s crop, but they’re about gone. 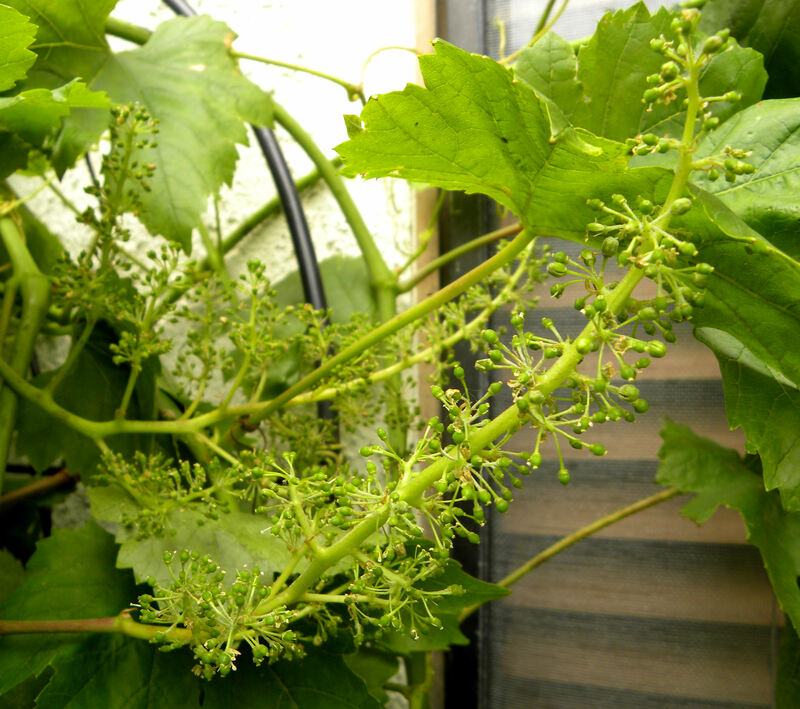 This appears to be full bloom for grapes. Not very impressive. But I’m excited to be growing my first grapes. It took the vines 3-4 years to get large enough to bloom, and this will be my first crop. 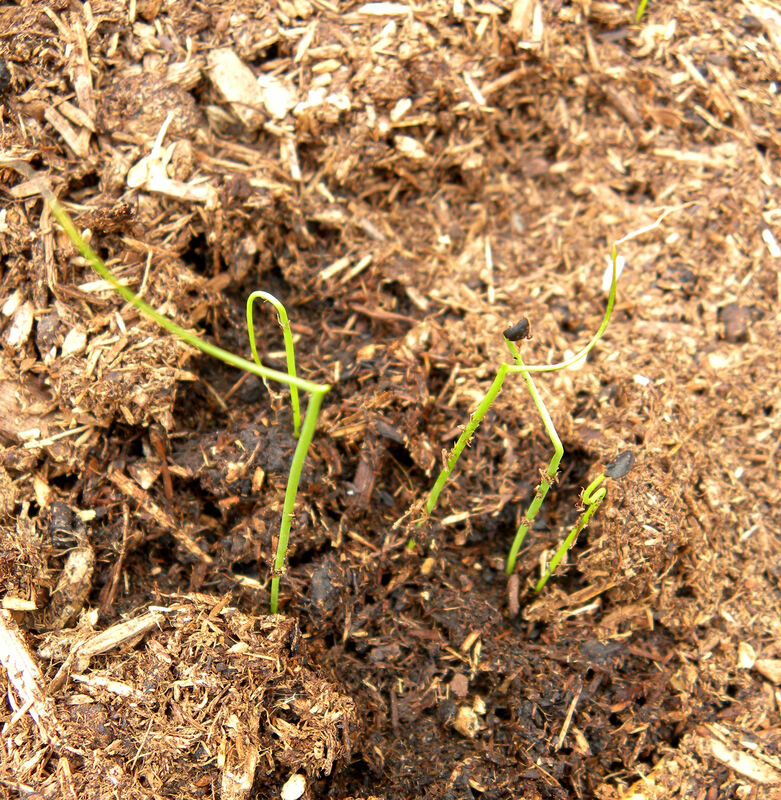 These green bunching onions have just sprouted. If you look closely, you can still see the black seed covers. I grow green onions in pots due to lack of yard space. 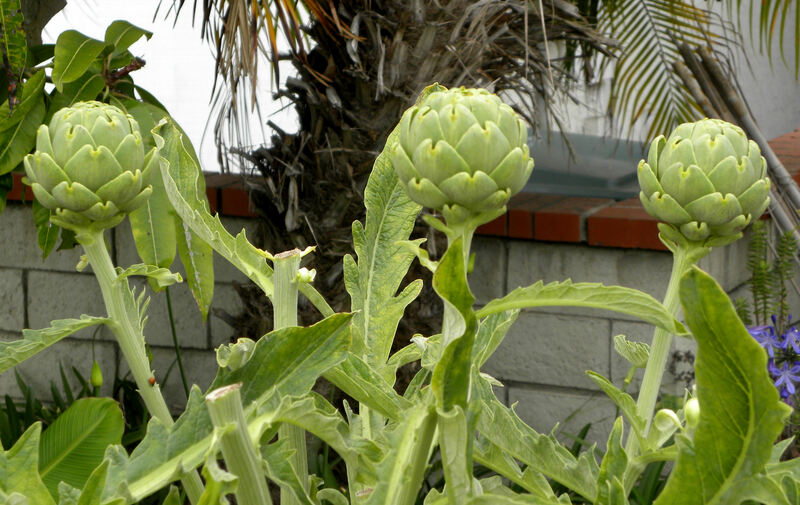 Our last three artichokes. We had them for dinner tonight. I planted a fourth fabric container of yams yesterday, plus two containers of Japanese eggplant. The potatoes in the fourth container back from the front are nearing harvest. They’re either blue or German butterball. New raised bed in front. 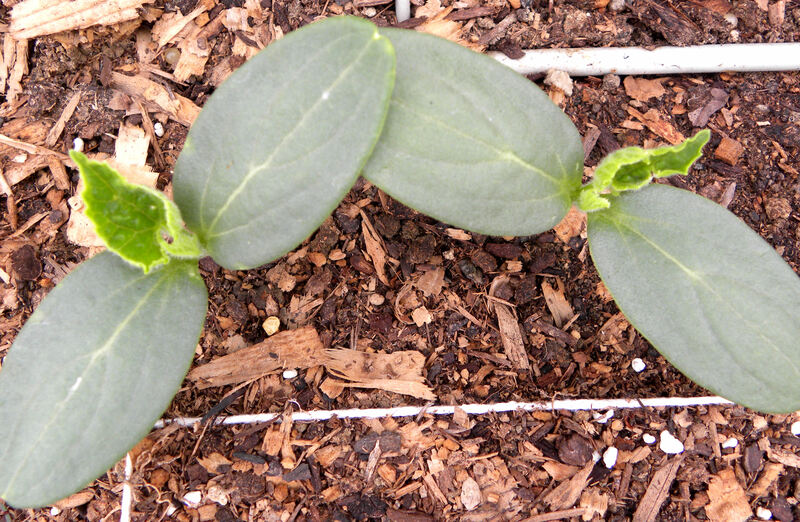 Cucumbers, either Tendergreen Burpless or Straight Eight. I can hardly wait for cucumber soup. I’m working now on the bare area to the back right of my new raised bed. 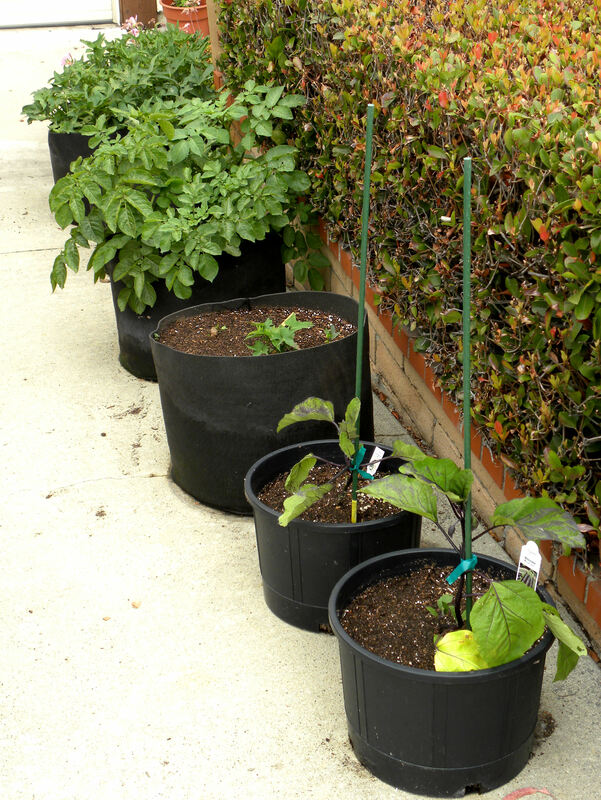 I plan to put in some tomatoes and pole beans there, with pumpkins on a small lower terrace out of sight in this picture. This is the first year that this variety of iris has bloomed for me. 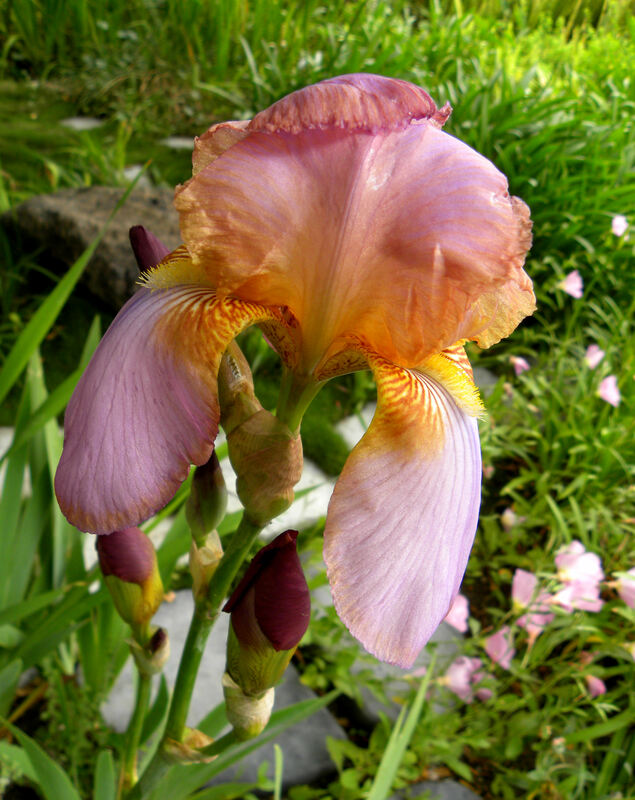 It has been a really good year for irises in my yard. That completes the photo tour of my garden. On to this week’s harvest. If you had a harvest, or to see what others are harvesting, visit Daphne’s Dandelions. 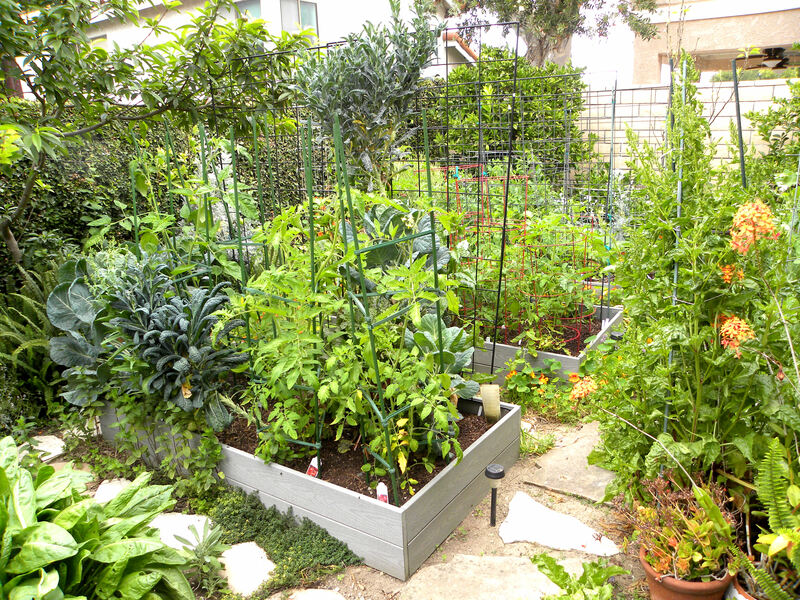 This entry was posted in Uncategorized and tagged apples, artichokes, avocados, cucumber, flowers, Fruit, green beans, Harvest Monday, photos, radish, raised beds, vegetable garden. Bookmark the permalink. My orange is dwarf too, I do enjoy watching the fruit develop, Your garen looks fabulously productive. Thanks, Liz. I know that you’re going to enjoy your orange tree. Yum that avocado looks so good. I’ve always had trouble wrapping my mind around your garden layout. I wish you had overhead shots so I could tell. Daphne, I don’t think I’m going to climb up onto the roof to get a shot like that. I’ll see if I can do a better job explaining in another post one of these days. Right now, I’m up to my neck in spring planting chores, and waaaaay behind. wow what a great variety of things you have! 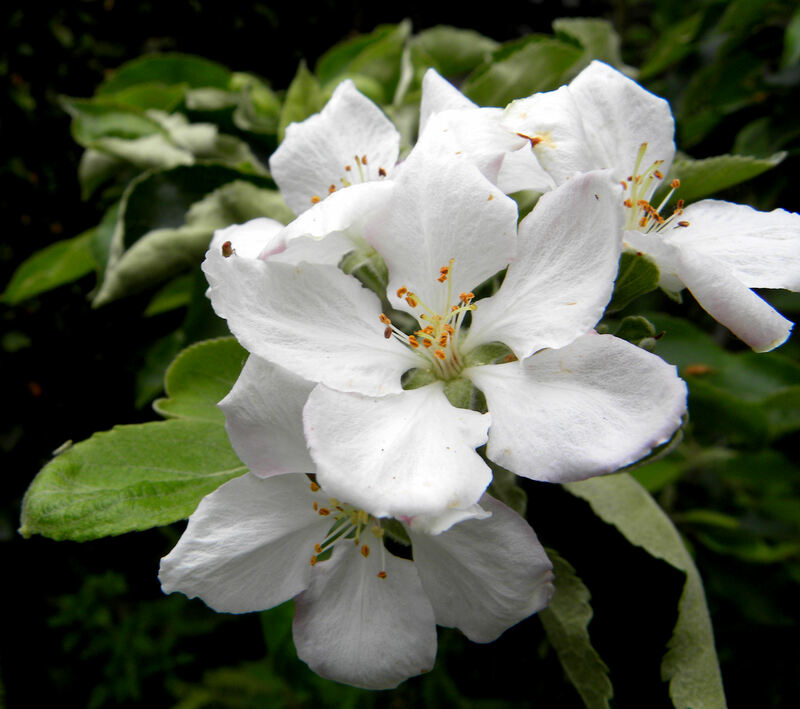 We had a late snow which caught the Granny Smith just as it bloomed. However the peaches, plums and an unknown variety of summer apple are all loaded. Mary, how sad that you lost your Granny Smith. 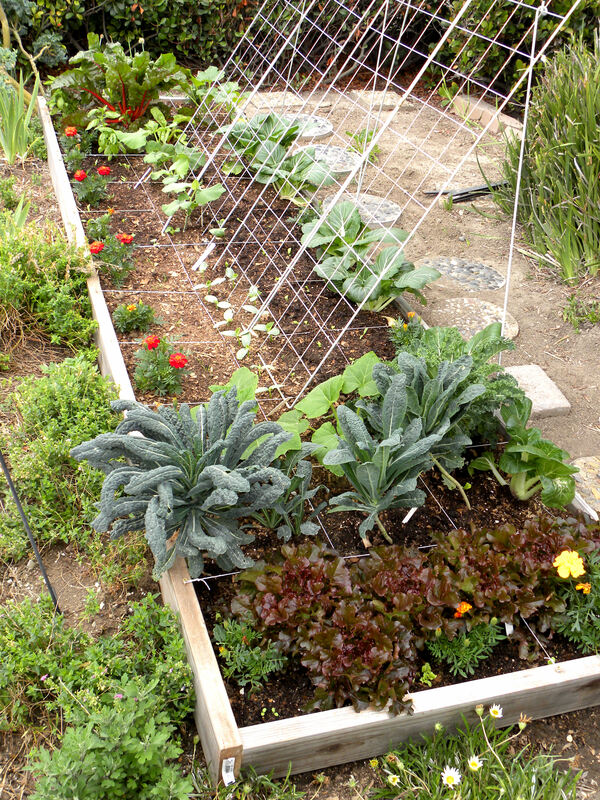 Unpredictable weather is hitting gardeners and farmers everywhere. That is one reason why I have a little bit of a lot of different things in the yard, hedging my bets. Persimmons already! Is this early or on time? We don’t typically see fuyu persimmons in the stores until around November. Norma, this is the first year that I’ve had persimmons on the tree, so I have no idea if they’re early or late. My guess is that, like apples, they will take a long time to harvest. The persimmons in the photo were only the size of my thumbnail. Thanks for the heads up that I should see if they’re ripe in November. You will have such bountiful harvests shortly! How wonderful everything looks! But that avocado…that avocado looks simply divine!!! Bee Girl, I wish all of my avocados looked as good as that one. It was perfect. 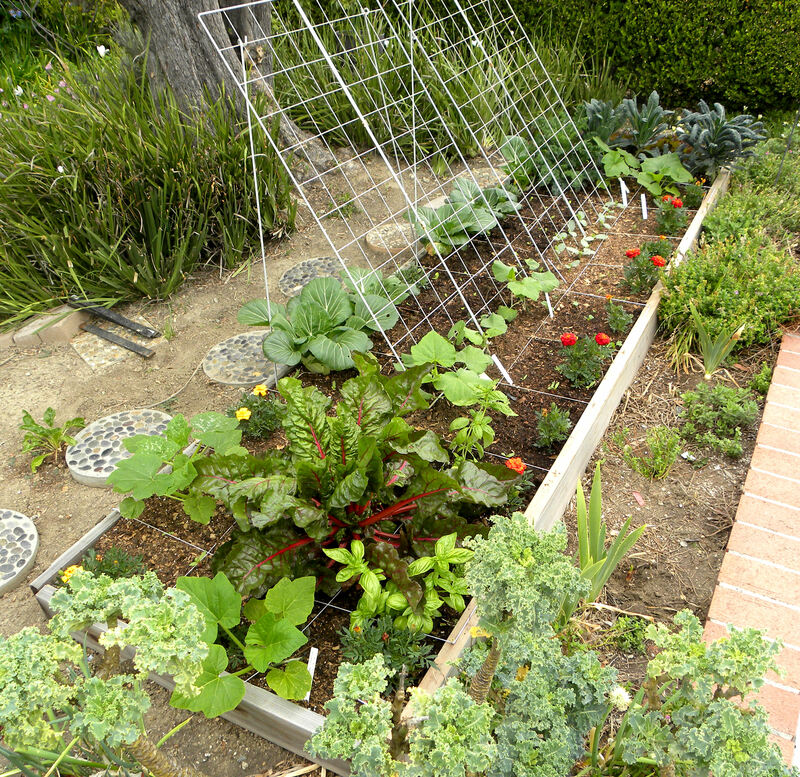 Whoa you have a lot going on in your garden, I’m envious of all the fruits you have, the avocado is perfect looking. I like your idea of planting next to the utilities meter, I wish our HOA would allow us to plant along both sides of the house. Mac, I try to make good use of my space. I keep thinking that I couldn’t possibly squeeze in any more produce, and then another place occurs to me and I expand once again. I’m thinking I need therapy.